Q: What drew you to the story of Ben & Jerry’s? A: Jeff Furman and I like to go out for coffee and tell each other jokes. He is chairman of the board of Ben & Jerry’s, I am a freelance journalist, we both live in Ithaca, NY, and over the last decade Jeff told me the company’s story in an off-the-record kind of way. 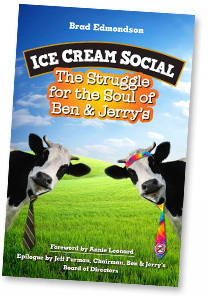 Two years ago, when Jeff said he was ready to talk on the record, I already knew that the story of Ben & Jerry’s was amazing, outrageous, and funny. So I jumped at the chance. Once I told a joke Jeff liked so much that he borrowed it, and now he tells it all the time. Here it is: An architect in Vermont has an important decision to make. His girlfriend is moving out west, so he must choose between staying with his own successful practice or following the woman he loves. As the architect is agonizing over this question, he hears that the Dalai Lama is looking for someone to design a Zen center. This is perfect, he thinks. I’ll design the center, meet the Dalia Lama when he comes to look over the drawings, and ask him what to do. My expectations for this book were high, and the story exceeded them. I worked on it full-time for a year and a half, and although I was not supported or supervised by either Ben & Jerry’s or Unilever, I had their full cooperation. The whole thing has been Jeff’s best joke on me, so far.